"This recipe dates to the early 1960's when it was the rage of Washington, D.C. It was frosted with a thick fudge icing." Preheat oven to 350 degrees F (175 degrees C). Grease and flour two 9 inch round pans. Sift flour, baking soda and salt together 3 times and set aside. In a small saucepan, heat water, chocolate and 1/2 cup sugar, stirring constantly, for 2 minutes. Remove from heat and cool to lukewarm. Cream butter and sugar until light and fluffy. Add 3 eggs, one at a time, beating thoroughly after each egg. Add half of flour mixture and beat until smooth. Add milk and remaining flour mixture alternately in 2 parts. Beat smooth after each addition. Add vanilla and chocolate mixture. Blend well. Divide batter into two 9 inch pans. Bake at 350 degrees F (175 degrees C) for 35 to 40 minutes, or until a toothpick inserted into the cake comes out clean. I chose this for my English Project and the class loved it! One of my favorite chocolate cake recipes! I've made it many a time and people love it. 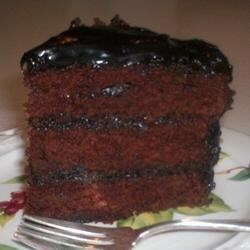 It's super moist and the flavor of chocolate is great, not too sweet. This is ALMOST the original recipe. There should be FOUR eggs, not three.